There is almost nothing as satisfying as having all your jumbled up files and information encoded into a single, organized, digital folder. Every business, whatever the nature, requires entry and compilation of data to undergo a smooth sailing business process. Businessdictionary.com gives the meaning of data entry as the direct input of data in the appropriate data fields of a database, through the use of a human data-input device such as a keyboard, mouse, stylus, or touch-screen, or through speech-recognition software. It mostly requires feeding the computer with data to be processed. 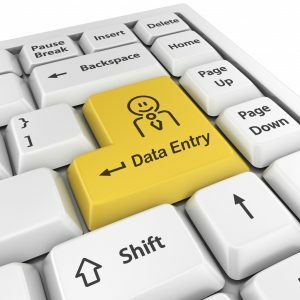 Data entry can also be said to be one of the most powerful tools for managing information. Utilizing data entry services is a practical solution business organizations must consider to ensure accuracy for their data, and as menial as the task of Data Entry may seem, it requires certain specialized skills and is most effective when handled by an expert. If a person is to have only one skill as a data entry operator, then it would have to be that of organization. For the compilation of information from different locations, completion of incomplete data, or the entering of data into one readable and accessible document to have any efficiency, they must be skillfully arranged in working order and in specific time. Customer information or other data may be incomplete and given to the data entry operator to fill in with the correct missing information. A good data entry operator must possess the skill of performing relevant research to provide accurate information. The whole purpose of the existence of data entry is to use computers, scanners and other specialized equipment to store data into the system. A data entry operator must therefore, inevitably have profound knowledge of the use of computers and database software. Entering data into a spreadsheet might seem like a relatively easy task. However, a large number of this task may be given to be completed during a short period of time. A data entry operator must therefore, be able to work with time and speed (proficiency in typing most importantly, and computer operations). Although speed may be required to meet up with deadlines, the data entry operator must also possess accuracy and take care to enter correct data, as data entry errors can create chaos and cause grave consequences. Reduction in infrastructure cost: there is little or need to provide extra space for files and documents when they can be converted into one easily accessible digital file. Improves overall work productivity and business efficiency. Reservation and secures information: as technology is of high usage in carrying out data entry, all documents and information are at less risk or deteriorating or getting lost. A professional Data Entry operator helps in organizing the information which plays an important role in the growth of business. There are many factors that are responsible for affecting data such as time, availability, duplication etc. With the help of good data entry service you can organize orderly and update the information as and when it is required. Reduces company costs: as information is stored in digital format, the need to spend money on print-outs will hardly arise. Contact a Data Entry Expert now and let you business reap the benefits. Amanda Onoabhagbe is a Content Marketer at Backdesk Innovative Solutions, Abuja. She has a passion for researching history and sharing information, using the most creative tools and her professional abilities in writing and public speaking. She is a performance artist as well as an events entertainment service provider, and can not get over her fascination of the world of literature and the arts. Copyright ©2018. BackDesk Innovative Solutions.